One of the things I like about what I do is the strangeness of my everyday situations. There’s more of the boring old Sitting At A Computer Situation than I would like, but the Measuring Baby Birds On A Mountaintop Situation helps make up for that. Now that field work is (mostly) over for the season, my situations are different, but not really less strange. In order to look at the genetics of the juncos, I’ve been doing lab work in the Museum’s Evolutionary Genetics Lab. Lab work was my introduction to ornithology as an undergrad, and I’ve always liked it, despite the bleach and the potentially-toxic chemicals and the way my nose always itches and I can’t scratch it because I’ve got latex gloves on. The colors, noises, and vocabulary of lab work are specialized and surreal: the stacks of plastic racks in bright red, yellow, blue; the whirr of centrifuges starting up, like tiny revving plane engines; aliquot, vortex, elution buffer. I like the contrariness of refrigerators and microwaves with NO FOOD scolded across them. The concentration required to pipette the right amounts of the right reagents into the right tubes again and again and again makes it a kind of meditation. Less related to my research, but because it’s a skill I should keep up and a service I can do for the Museum, I’ve started prepping bird specimens once a week. 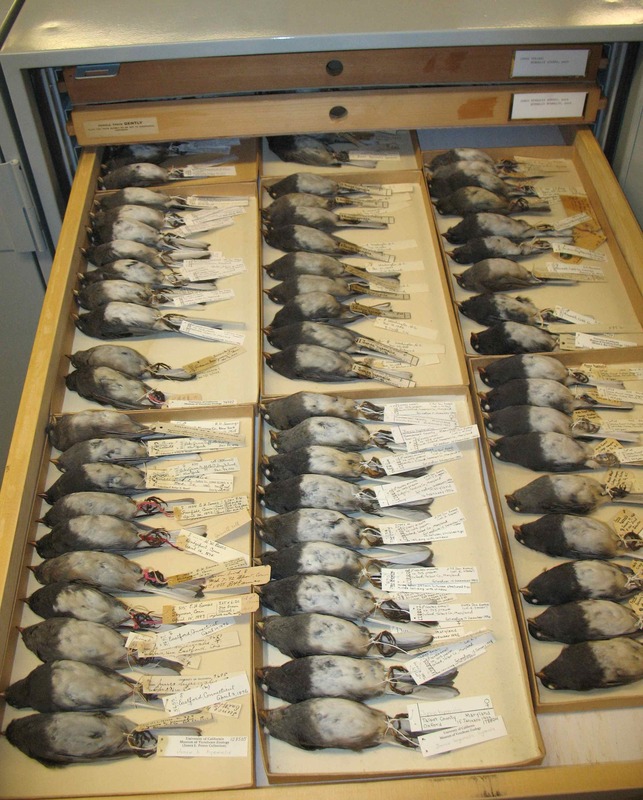 The Museum receives donations of dead birds from the public: roadkill, windowkills, cat kills. The dead birds are prepared—prepped—as museum specimens, either as whole birds preserved in formalin or something similar (“pickles”), as cleaned skeletons, or as stuffed skins. I’m planning to measure old junco skins as part of my own research. I’ve prepped pickles, skeletons, and skins before, but it’s been a while. On Wednesday I prepped a juvenile male Montezuma Quail skeleton. Unfortunately, the nicest-looking birds are reserved for skins, so if you’re prepping skeletons you have to be prepared to work with not-so-nice specimens. My quail was further along the road to decomposition than I would have preferred. Still it was fun to admire his long legs and his secret long neck, and to open his crop and see the seeds and insects he had eaten. The Prep Lab has bleach and oversized freezers and latex gloves like the Evolutionary Genetics Lab, and prepping can be meditative too, if smelly and bloody and punctuated by comments like “I think my eyeballs are coming out.” The Prep Lab has trash bins lined with red Biohazardous Waste bags and the largest bottle of dish soap I’ve ever seen. It has a bucket filled with water in which skinned and gutted specimens soak; it has those same specimens, post-immersion, hanging from a rack to dry to jerky; it has aquaria filled with dermestid beetles, small dark insects which eat the jerky and leave beautifully cleaned skeletons with even the most delicate bones still in place. The best skeletons belong to the snakes, their many-ribbed bodies in sinuous curves inside their specimen boxes. I imagine there are situations in any line of work that look strange. These are just the ones I know. This entry was posted in miscellaneous and tagged birds, lab work, science, skeletons, specimens by toughlittlebirds. Bookmark the permalink. Not being a scientist, the phrase “small dark insects which eat the jerky” is going to stick in my head a long, long time. Haha! Don’t worry – for flesh-eating insects, the dermestid beetles are disappointingly un-creepy. They’re too picky: they only eat dried meat, they don’t like guts or skin or eyeballs…. they’re like little kids with vegetables. Ha! Somehow mentioning dried meat, guts, skin and eyeballs doesn’t really help. There’s a reason I’m a nature observer and not a nature/scientific writer! Nice description of the lab work that you do. It reminds us of the large amount of work behind the scenes in any museum. Whille doing a search for museum bird skins I came across your blog. It is informative and funny. Will definitely return to it.